Once I realised that I was keen to change it, and one thing that's made a difference is a book I came across called The Valley of Vision. 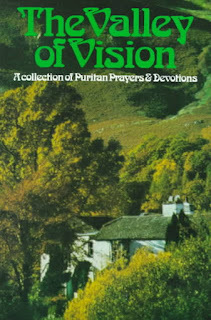 As the subtitle says, it's a collection of prayers and devotions coming out of the puritan movement. I don't know much about the Puritans, but some of the authors of the prayers have names familiar to me: John Bunyan, Isaac Watts and Charles Spurgeon. The editor, Arthur Bennett, has substantially re-written them to make them more suitable for personal devotional use (turning all the 'we's into 'I's etc.) The prayers are all from the 17th-19th century so the language is somewhat archaic, but they've been type-set in a way that makes them easy to follow and I've only had to look up one word so far to confirm its meaning! I'm trying to pray through one a day, reading through it slowly, translating it into my own words as I do so, then going back and reading it through in one go. As I've done so, I've been struck by how 'normal' I am. Besetting sins that have felt unique to me are addressed so often in these prayers. It's been a relief to see that! I've also been troubled for some time by how un-trinitarian my interactions with God are. I know that God is three-in-one and all that; I even see it as really important. But when I pray, I tend to simply address 'God'. My theory is trinitarian but my practise is monotarian (to coin a phrase). Again, these prayers have shown me that I'm not alone in that, even though I received such puzzled reactions the one time I tried to raise this issue with my Bible study group. Several times this week I started muttering to myself about someone else's uselessness and inadequacy, as has sadly become my custom. However, I'd hardly started before words I'd prayed earlier that day were brought back to my consciousness. I quickly turned from 'superior' criticism to sincere meditation on my own inadequacy, and soon found myself asking for God's mercy. My 'felt' beliefs about my own inherent sinfulness seem already to be aligning better with my theoretical theology :-) My 'free-form' praying is morphing into a more trinitarian style, too! I'm so grateful to have found The Valley of Vision and look forward to exploring its riches for some time.